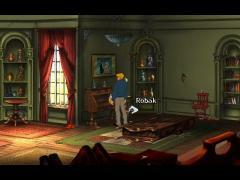 The homebrew coders from the ScummVM Team has recently updated their classic cross-platform point-and-click adventure games emulator, ScummVM. Added support for Castle of Dr. Brain (EGA and VGA). Added support for Codename: ICEMAN. Added support for Conquests of Camelot. Added support for Conquests of the Longbow (EGA and VGA). Added support for EcoQuest: The Search for Cetus. Added support for EcoQuest 2: Lost Secret of the Rainforest. Added support for Freddy Pharkas: Frontier Pharmacist. Added support for Hoyle's Book of Games 1. Added support for Hoyle's Book of Games 2. Added support for Hoyle's Book of Games 3 (EGA and VGA). Added support for Hoyle Classic Card Games. Added support for Jones in the Fast Lane. Added support for King's Quest I (SCI remake). Added support for King's Quest IV (SCI version). Added support for King's Quest V (EGA and VGA). Added support for King's Quest VI (low and hi res). Added support for Laura Bow: The Colonel's Bequest. Added support for Laura Bow 2: The Dagger of Amon Ra. Added support for Leisure Suit Larry 1 (SCI remake) (EGA and VGA). Added support for Leisure Suit Larry 2. Added support for Leisure Suit Larry 3. Added support for Leisure Suit Larry 5 (EGA and VGA). Added support for Leisure Suit Larry 6 (low res). Added support for Mixed-up Fairy Tales. Added support for Mixed-up Mother Goose. Added support for Pepper's Adventures in Time. Added support for Police Quest I (SCI remake). Added support for Police Quest II. Added support for Police Quest III (EGA and VGA). Added support for Quest for Glory I/Hero's Quest. Added support for Quest for Glory I VGA remake. Added support for Quest for Glory II. Added support for Quest for Glory III. Added support for Slater & Charlie go camping. Added support for Space Quest I (SCI remake) (EGA and VGA). Added support for Space Quest III. Added support for Space Quest IV (EGA and VGA). Added support for Space Quest V.
Added support for The Island of Dr. Brain. Added Caanoo port (based on the GP2XWiz port). Removed the outdated PalmOS port. Switched to the "fast" DOSBox OPL emulator. Fixed a crash in the rjp1 player code affecting the FOTAQ Amiga version. Added support for more original media layouts. Added support for GUI localization. Improved GUI by adding tooltips and radiobuttons. Improved GUI usability by hiding more irrelevant options not supported by specific games. Fixed number of GFX glitches. Made PIC drawing code picture perfect. Added support of MIDI devices. Added support for accurate Tandy sound emulation. Switched to it as default. Fixed missing speech in some cutscenes. Changed behavior of items menu. Now it shows up on mouse up. Added support for the Macintosh version of The 7th Guest. Added support for custom MT-32 instruments. Fixed some minor graphical glitches. Implemented formerly missing recreation of some in game items. Added support for playing Kyrandia 3 with the original CD file layout. Made part one of The Big Red Adventure completable. Fixed graphics glitches in several scenes. Several improvements in Maniac Mansion NES. New backend design: fixed minor graphical issues and enabled 16-bit support. Enabled playback of MP3 files using the Media Engine. This means that the port is optimized for MP3 files (as opposed to OGG). Many optimizations. Everything should run faster. Added support for USB2 mass storage devices (requires The Homebrew Channel >= v1.0.8 with IOS58).